When visiting a hotel website, people expect to find answers to the same questions that we all have when booking a trip: what’s the offer, what are the benefits and how much it will cost. One way or another, every piece of content on your hotel’s website should address one of these three questions. For the purpose of this post let’s agree on one thing: a hotel website should serve a utilitarian purpose, not an artistic one (unless that’s your very specific niche). So every element on your website should bring value to your visitors and answer some of their questions. The user experience (UX) should be comfortable and intuitive. Thanks to this it becomes a little easier to determine what a hotel website should and should not have on it. Most of these suggestions are relevant and achievable on any hotel website, regardless of the content management system used, be it WordPress, Joomla, Wix or even static HTML websites. 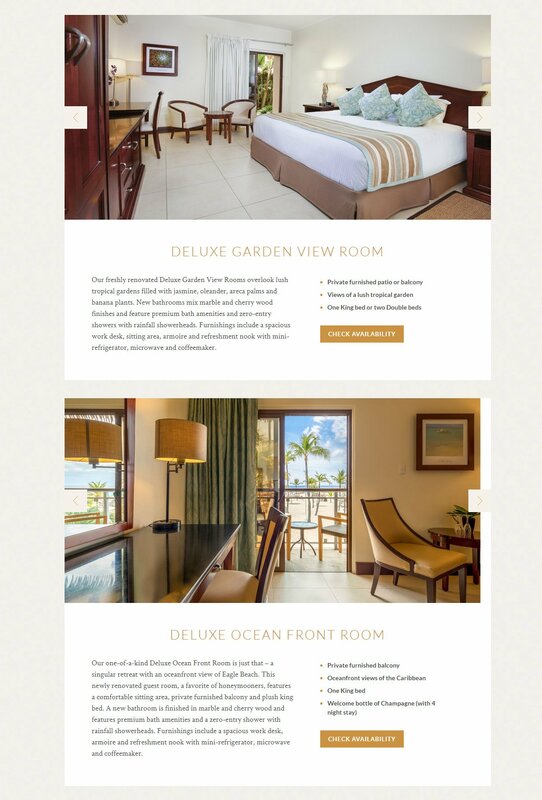 After seeing what a blessing WordPress can be for independent hotels and B&Bs, in 2013 I have started HermesThemes, a WordPress Themes shop that caters to the hospitality industry. 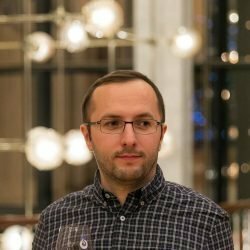 Since July of 2017 I have started a continuous analysis of more than 1 million hotel websites from every country on planet Earth. I run automated tests, I gather stats and I manually verify and compile all the data. I published some of my findings in The Current State of Hotel Websites (September 2017) post. I use some of this data for a small project called Instagram Leaders, an ongoing ranking of the most followed hotel Instagram accounts from over 200 countries and locations. You want to engage your website visitors as soon as possible, so having your contact information in a visible location is essential. Make it easy for them to get in touch via the best contact methods: email and telephone. Imagine guests that are stuck on the highway or are lost somewhere. Is it easy for them to quickly get in touch with you using the website? They should be able to find your telephone number directly from your homepage, preferably in the header or the footer of the website. Delaire Graff Estate does a good job with their contact information in the website’s footer. Having an original website design is good, but it should not come at the cost of your visitor’s frustration. People have been using the Internet for over 20 years now, so they have grown to expect certain patterns on a website. Let’s take a quick look at something simple: the importance of logo placement in the header of a website. Most websites have the logo on the left. Many websites experiment by placing it in the center (which also looks better on mobile), while some try to stand out by placing the logo (and the menu) on the right. According to a study by Nielsen Norman Group, people are 89% more likely to remember a brand if their logo is placed on the left instead of the right. The same study shows that people don’t find websites with a logo on the right to be more unique, it is the opposite. For every design we compared, we found that more users remembered the brand name when it was displayed on the left side of the page, rather than the right side. This difference was statistically significant. According to another study by Nielsen Norman Group, a centered logo hurts website navigation. Getting back to the homepage is about 6 times harder when the logo is placed in the center of a page compared to when it’s in the top left corner. The bottom line is this: originality is good, but you have to be extremely careful when you want to break patterns and surprise your visitors with something unconventional. Great photos can be your best marketing asset, so don’t settle for mediocre photos. They should also be current. You can keep historical photos of your property on the History page, but guests want to see how your hotel looks today. Guests should know if you are located on a crowded street, if cars are parked right under their windows, etc. The people at Booking.com recommend that each room should have at least 4 photos from different angles. Breakfast area photos are very important, as that’s where most of your guests will start their day. If you serve lunch and/or dinner, make sure to showcase how the dining room looks in the evening. People should know what to expect: a crowded, noisy place or a quiet place for a romantic dinner with their loved one. People should be able to see what facilities you provide: a swimming pool, a sauna, a playground or a sunbathing terrace, show them all. Do you host events at your property, like weddings, birthdays or business seminars? You have to showcase the type of events that you can accommodate. Want to see what great B&B photography looks like? Check out the portfolio of Jumping Rocks (based in Philadelphia). I’ve been following their work for many years, and I’m always amazed by their fantastic ability to frame a property. We are not affiliated in any way, this is just honest praise from a fellow photographer. When working with a professional web designer, clients expect to get the best results for the money that they invest, which is why they hire a professional. Here’s the thing though. Designers love to design, and that’s good. The problem is that some designers focus on making things look pretty. Very often this is very easily achieved by using a small font size and low contrasting colors. Here are two examples of bad readability on otherwise good hotel websites that I like. Hôtel Byblos has a beautiful website that matches the brand and style, but the homepage headline and description are annoying to read, so I just skipped them. Is that the desired result? Katzenthalerhof Hotel from South Tyrol has a nice and modern website, but there are a few mistakes that I would like to see fixed. One of them is the paragraph’s length. Text that is 1200 pixels long is very difficult to skim and scan, which is what most people usually do. In a 2014 article by The Washington Post, researchers found out that people are so used to skimming and scanning text online, that they are now doing it when reading books. Without going too much into it, general readability rules state that the ideal line length is 45-75 characters. In this example, one line has an average of 170 characters per line. You’re doing it wrong when someone has to physically turn their head while reading a single line of text. With some variation depending on location and audience, some things should be present on every property website, be it a hotel, hostel, B&B or a large resort hotel. All hotel websites should have a clear summary on the homepage, preferably as close to the top of the page as possible. You should not assume that a website visitor will know exactly what he/she is looking at. Make it clear what you are, where you are and what you have to offer. Consider this example: Siena House is a boutique hotel in Tuscany, Italy. They are located in the region of Siena, so their name makes perfect sense. But there’s also a Siena House hotel in Sozopol, Bulgaria. The Siena House homeless shelter in New York and the Siena House Maternity Home in California. Sure, an attentive visitor will immediately understand if they are on the wrong website. But for both usability and SEO purposes, it is a very good idea to have a paragraph or two describing your property. 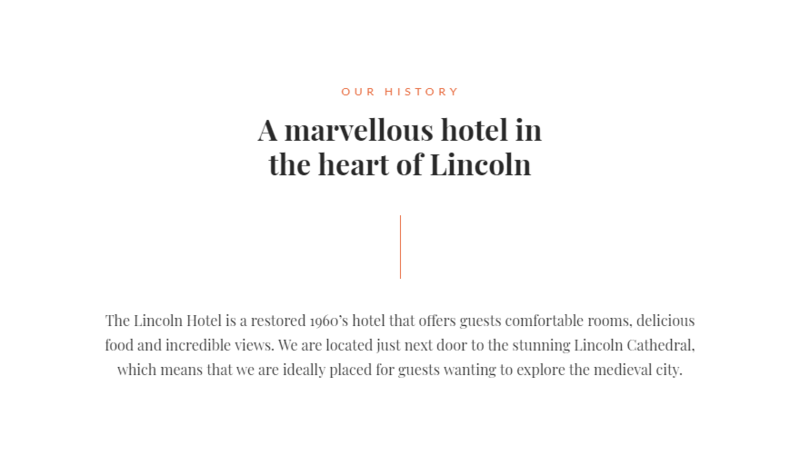 An example of a good property description by The Lincoln Hotel. 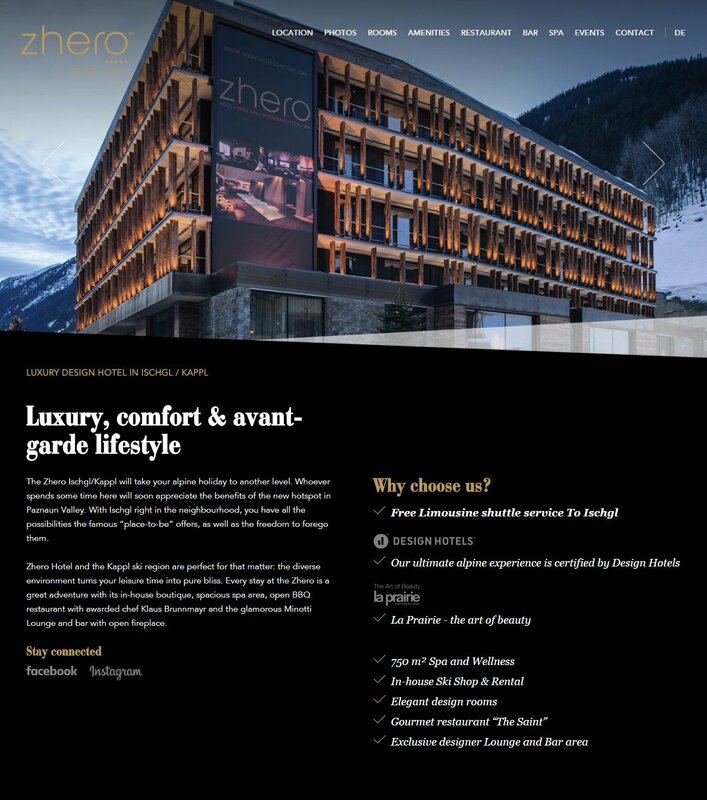 Another example of a good property description by The Zhero Hotel from Ischgl/Kappl, Austria. On 29 of them (85%) the main menu contains between 6 and 10 items. On 28 of them (82%) the main menu is horizontal. Only 9 of them (26%) have a dropdown menu. Identify what the big players are doing, learn and adapt. Some of these chains invest millions of dollars into research and website analytics, so why not learn from them a thing or two? An example of a main menu on a Radisson Blu hotel (The Carlson Rezidor Hotel Group). An example of a main menu on a Raffles hotel (AccorHotels). 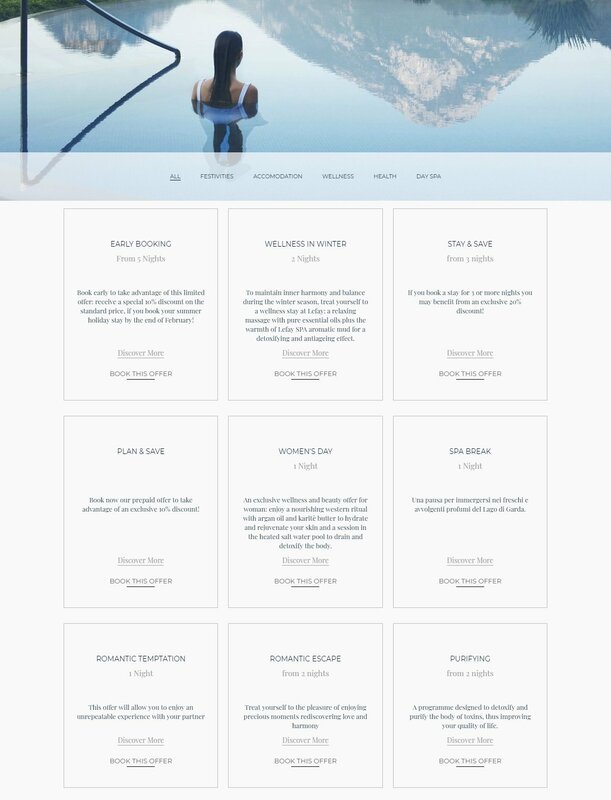 Not to pick on them specifically, but consider the main menu of Vigilius, a luxury mountain hotel in South Tyrol. Even though the labels make perfect sense for their overall style, it creates some friction and confusion. The current menu requires the potential guest to work a little bit, to hover over things, to review all menu labels before clicking on something. Not to mention the fact that the dropdown menu becomes completely unusable to people that can’t use a mouse, be it for physical or personal reasons. If you don’t know how to organize your menu structure and/or how to call your pages, take a look at the table below. These are the most used menu labels on the 34 chain hotel websites. If your visitors are frequent travelers then they might be expecting a combination of these words in the main menu. 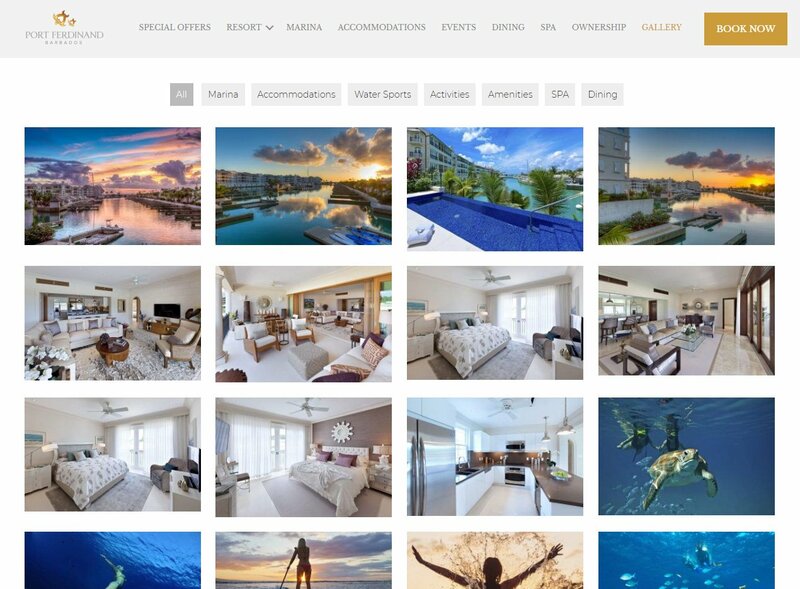 Every hotel website should have a separate Gallery page with the most current photos of the property. People shouldn’t have to hunt for a photo of your exterior or the breakfast room. The most popular way of displaying your gallery is in a grid format, usually with 3, 4 or 5 photos in a row. In my opinion the thumbnails should not be smaller than 160×160 pixels and not larger than 300×300. Take a look at the Gallery of Port Ferdinand Resort in Barbados. No sidebars, no distractions, just a way to filter the photos by their category. Photos are large enough to impress, but small enough to fit on the page. Clicking on them of course brings up a lightbox with their larger versions. An Overview page (called About Us, The Hotel, The Resort, etc.) should be like a complete brochure for your property. A visitor should be able to find all relevant information about your property from this single page. Here’s a good example: the website of The Serras Hotel in Barcelona, winner of the World’s Best City Hotel award at the Boutique Hotel Awards 2017. Each block could be linking to additional pages or keep everything on a single page, it depends on how much content you have. Don’t make your potential guests hunt for information about special offers and promos. Make it easy for them to find that as soon as possible. The Chester Grosvenor, another winner at Boutique Hotel Awards 2017. Lefay Resort & Spa, another winner at Boutique Hotel Awards 2017. A good Rooms page will help visitors choose the right room for their trip. This is especially useful when your rooms have unconventional names, like “Hamilton Room”, “Rosemary Room”, etc. Manchebo Beach Resort & Spa, Aruba. Your rooms list should preferably display: a photo, a short description, the room size, capacity and standard rate per night. Pro Tip: you’re the one who knows your rooms best. So when possible, suggest different rooms to different types of guests. Add a line for each room recommending it to a certain category of guests. For example: “Who books it: couples” or “Who books it: families with children”, etc. This will help visitors spend more time researching the rooms that are more appropriate to them. Wherever your property is located, be it in the center of a major city or on the outskirts of a small village, people need to know their dining options. You should make it as clear as possible what you offer in terms of food and drinks. Even if you’re a B&B without any dining options, you should have a page dedicated to that. Make a list of restaurants, cafes, bars and pubs that are near you. If there are too many to choose from, you should try out some of them, check their reviews, etc. and recommend only the best places. Create a calendar of business events, fairs, expos, etc. This will add some keywords that, with some luck you might rank high for. It will also show that you are knowledgeable about what happens in your area and will help you adapt your rates for the busy days. Create a calendar of local events and regional holidays, there’s always something to write about, no matter how small or niche it is. What do people usually do when they visit you? If you have many concertgoers because of your proximity to a certain venue – put it out there. Do people come to your property for hiking, fishing or anything else? Write about it. Identify what needs you satisfy the most and make that clear on your website. Pro Tip: Set up a free Google Alert for your city/location name and get immediate, daily or weekly email alerts of new pages that contain your term. You can even set up multiple alerts, totally free of charge. 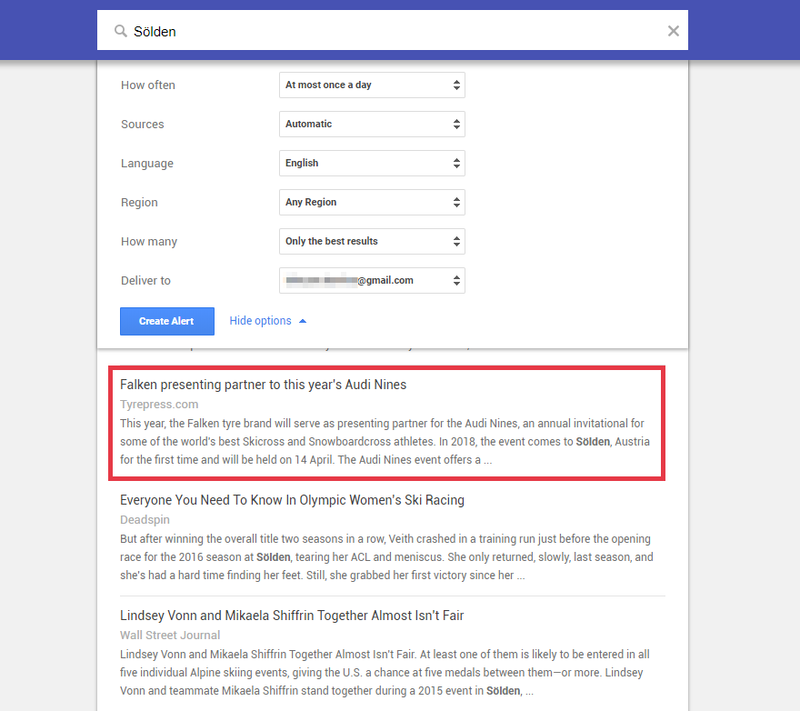 Example of a Google alert for Sölden, a popular ski resort in Austria. It took a minute to find out that a major snowboarding event is coming up. Add it to your calendar, blog about it and maybe adjust your room rates accordingly. Even though this event is most likely advertised throughout the resort, smaller events will probably not get much attention. But you will know. You might be one of the most informed hoteliers in your location. With effort and luck, that knowledge could transform into additional revenue. Do not assume that only leisure travelers are interested in exploring the surrounding area. The term “bleisure traveler” is proof of that. Bleisure travelers are people who extend their business trips by a few days for leisure purposes. CNN had a story about Bleisure travelers. According to a study by Global Business Travel Association, 37% of the surveyed 675 North American business travelers have taken a bleisure trip in the prior year. Let’s look at an example of a good Explore page. The What’s Nearby page of Strand Hotel in Singapore is a very useful page to have. It fulfills multiple needs: shopping, exploring and eating. Would your guests benefit from a similar page on your hotel’s website? Go for it! The following tips are not applicable for all properties, but you should at least be aware of them. Not to be confused with a chatbot, which I find useless and overhyped, Live Chat became a popular and beneficial feature on many websites, especially on E-commerce websites. A Live Chat is that little message box that appears in the bottom-right corner on some websites, with a person on the other end suggesting a quick chat to answer your questions. This is a great way of informing visitors about the benefits of booking direct and not via an OTA. Even though this requires someone to be online in order to provide live assistance, chances are that you already have someone being in front of the computer all day. A live chat service can be kept open in a separate window while you do other things. A sound alert will notify you when someone’s trying to engage you in a chat. And when you’re not online, all these questions from potential guests will be sent via email, so you get good leads. 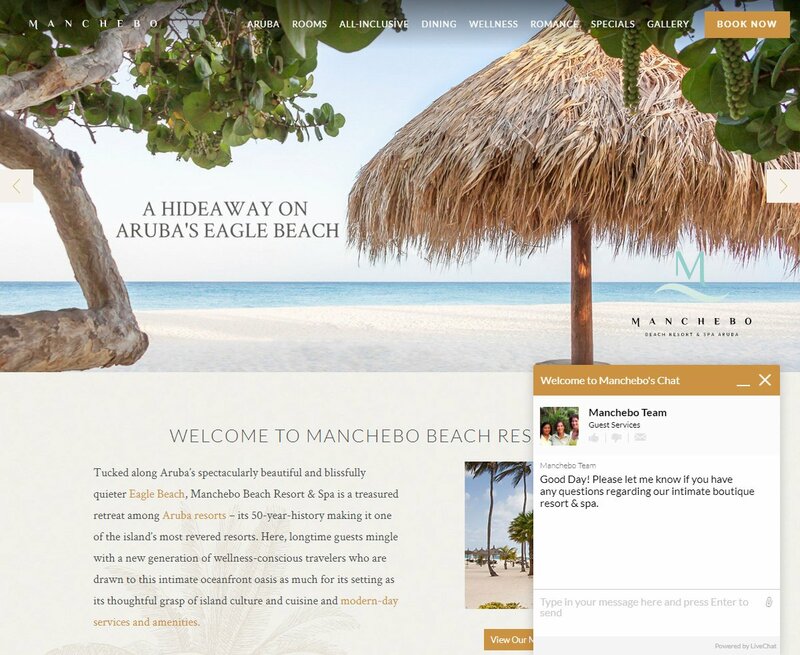 Again the website of Manchebo Beach Resort & Spa, Aruba. You should definitely experiment with Live Chat and see if it works out for you. Make sure that the time invested converts into sufficient bookings. Zendesk Chat: from $14 / month, FREE plan available. HermesThemes uses Zendesk, you can see how it works in the bottom-right corner. Freshchat: from $15 / month, FREE plan available. LiveChat: from $16 / month, FREE 30 days trial available. We have written before about How Hotel Press and Media Kits Help You Get Publicity. In short, a press kit will make it easier for interested journalists to understand what your property is about. A press kit usually contains a short summary of the property, the names and photos of main staff, facts and figures, etc. 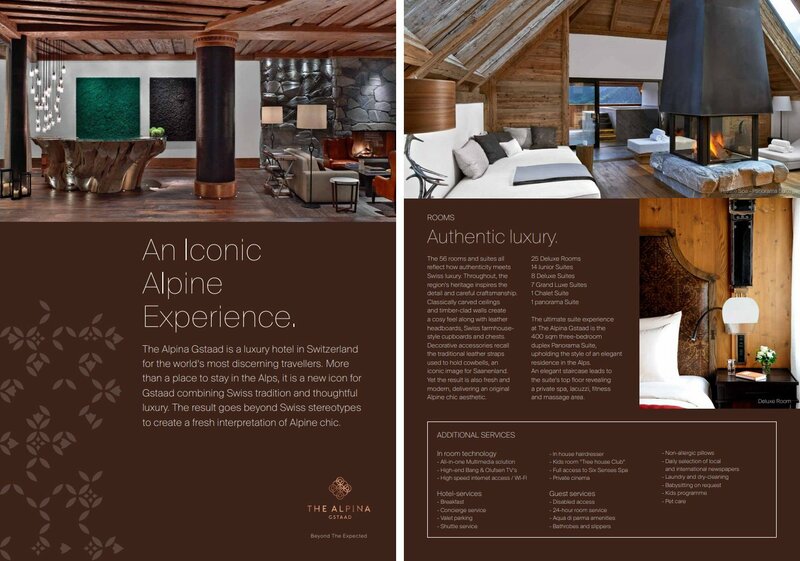 You can see a very good example of a hotel Press Kit on the website of The Alpina Gstaad, Switzerland. Not all properties are lucky to get press mentions in mass media. Nonetheless, if you have been in business for multiple years then there are probably at least a couple of blogs and smaller websites that have reviewed your property. Link to bloggers and influencers, the Press page can have even the smallest stories. The Halcyon House boutique hotel from Australia display their numerous press mentions and awards on a single page. I have cropped out many of them to make the screenshot shorter. I have to mention some of the worst things that many hotels do with their websites. 4.1. Video or Music that Autoplays. You should never have videos or audio content that begins playing without the user’s consent. This is one of the worst user experience mistakes in web design. There are so many reasons to avoid this at all costs. 2008 was a decade ago. your boutique hotel website should NOT have auto play music. When users arrive at a webpage, they don’t appreciate being surprised by video or audio content that begins playing without their consent. Video, and the accompanying audio, can confuse or distract users, and can interfere with their consumption of content on the page. Those users who do not want to watch the video must devote cognitive resources and extra effort to figure out how to turn the audio off or pause the video, rather than focusing on their goals and information needs. Even Google has decided to take measures against websites that try to play audio and video without the user’s consent. 4.2. Too many links to reviews on OTA websites: TripAdvisor, Booking.com, etc. According to the stats published in Current State of Hotel Websites (September 2017), ~37% of hotel websites link to Facebook, ~17% to Twitter, 10.6% to TripAdvisor and 8.75% to Instagram. Some properties feel the need to prove their worth by showing off their rankings on websites like TripAdvisor. Sounds like a good idea, but sometimes it has the opposite effect. Every time you place an external link to an OTA or a social media account, you run the risk of losing a customer. They might get lost in the reviews, they might start considering a different property with a better ranking, or what’s more likely – they will book your hotel via an OTA, even though you already had them on your website. So you end up paying a commission for a booking that you could have had anyway. Yes, I know that almost everybody will tell you to link to social media as much as possible, show off walls and walls of user generated content. Sure, you can do that. But before you do, at least do a A/B test for your conversion rates. And I’m not saying that you shouldn’t use Facebook or Instagram. You should use them, but social media should be generating the traffic for your website, not your website for your social media accounts. Let’s look at the website of Spier Wine Farm from South Africa. In my opinion, having the social icons both in the header of the website and in the footer is overkill. If someone is looking to connect with you on social media, then they are used to finding the icons in a sidebar or in the footer. So removing them from the header won’t negatively affect your social media accounts, but it will free up some valuable real-estate in the header of the website, make it less overwhelming. A hotels’ photography is so important that I decided to address it twice in the same post. I still find websites with just 3-4 photos of their property, or photos so small that you can’t discern anything on them. A current, high-resolution photo is most important than a professional photo taken 15 years ago. Even if you invested good money in them, outdated photos should be discarded or moved to a separate page. Unless it’s a room upgrade, nobody wants to walk into a booked room and discover that the furniture is different, the walls are painted in a different color, etc. Even if you are shooting on a modern smartphone, there’s no reason to deliberately taking bad photos. Choose a good angle, stabilize the phone on something. Think about framing for a few seconds. Take that trashcan out of the way. If there’s a bed in the photo then make sure it is wrinkle-free. Crooked, blurry images send the message that you are negligent and don’t put too much thought into your work. Maybe you have the same attitude towards room cleaning and hygiene when preparing breakfast? Have you got other tips for a great hotel website, have I missed something essential? Or do you think that some of these tips are overrated and are not as important as I make them to be? I would like to hear from you, so please feel free to comment below.